Did America enter a post-racial era with the election of a black president? The answer still appears to be a resounding “no.” Race relations in the American media continue to be a contentious topic with many Americans still not ready to see each other as simply Americans. Economic policies have also played a role in making race an issue in the social interactions Americans have with one another. 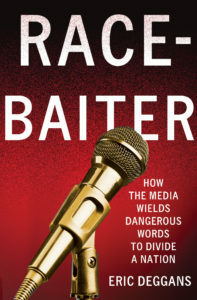 Eric Deggans, author of “Race-Baiter: How the Media Wields Dangerous Words to Divide a Nation”tackles race relations in the U.S. media and uncovers the subtlety with which media injects a sense of prejudice and insecurity into people’s mind. Mr. Eric Deggans is a veteran TV and media critic for the Tampa Bay Times, Florida’s largest newspaper, as well as a freelance contributor to National Public Radio, CNN.com and the Huffington Post. Mr. Deggans has won awards for his journalism from the Florida Society of News Editors, the National Association of Black Journalists, the Society for Features Journalism and American Association of Sunday and Feature Editors; his work also has appeared in the Washington Post, Seattle Times, Chicago Sun-Times, Ebony magazine and Rolling Stone Online. He sat down with Reza Akhlaghi of Foreign Policy Association to discuss his book and the media’s coverage of race. Your book starts with an episode from a gathering in Sarasota, Florida, where Bill O’Reilly of Fox News was giving a lecture and fielding questions from the audience. Then you were asked by the president of the organizing group a rather outrageous question “Will you be civil?” What do you think the rationale was behind this question? The moment you’re describing actually took place before a speech O’Reilly was giving in Sarasota. He had decided to meet a few reporters in a small press conference before the speech, and one of the organizers asked me if I would be interested in coming down. I think the head of the group organizing O’Reilly’s speech asked if I would be civil because O’Reilly or his people asked her that question. I’ve been a longtime critic of how he talks about race on his show, and I wonder if they expected me to confront him the way he confronts opponents on his own show. But anyone who knows me or my work knows that is not how I handle such discussions. I also wondered if he or his people assumed I would be emotional and angry because of my race. I have no evidence for this suspicion. But whenever people expect me to be angry and unreasonable in situations where they have no evidence that I am inclined to such reactions, I wonder if people aren’t making assumptions based on another reason. Can you elaborate on where the term “race-baiter” comes from and what it implies? As I explain in the book, the term race-baiter has been around for quite some time and was not originally coined by conservative media. The earliest references researchers could find for me were back in the 1920s, and they seemed to refer to white people who used fear against non-white people for political advantage. An example might be a white politician who spoke of the dangers of integrating with black people or allowing black people voting rights in order to win support during an election. In more recent times, conservatives have used the term “race baiter” and “playing the race card” to describe people of color they feel are using unfair charges of racism against white people to gain political or personal advantage. An example of that might be Al Sharpton championing the cause of Tawana Brawley, a black girl who alleged she was raped by white men in a case which was eventually deemed to be fraudulent. Of course, even though some black people have made high-profile allegations of racism which proved untrue, that does not mean every allegation is unfounded, or that America is such a fair country that most such allegations are false. But that seems to be what many conservatives believe – a view echoed by media outlets seeking to profit from conservative audiences, such as Fox News Channel – leading many to automatically reject all but the most egregious examples of prejudice and stereotyping. In your book you refer to “political advocacy disguised as news coverage.” What do you mean by that and do you believe it is widely practiced? There are many media outlets which report news from a given political perspective. Some outlets are more honest about their political goals than others, and some outlets work harder to be fair in their reporting, even if their outlet has a political perspective. This trend seems to be worst in cable TV news and online, where platforms such as MSNBC, Fox News Channel, the Drudge Report, the Huffington Post, World Net Daily, Breitbart.com and many others focus their reporting efforts on stories which bolster their point of view. Such activity becomes a problem for media consumers when the outlets twist their reporting to confirm political goals or ideas. MSNBC has been criticized for editing video of testimony during a public hearing to make it seem as if gun control opponents heckled a parent whose child died in the shootings at Sandy Hook Elementary. Similarly, Fox News’ Bill O’Reilly was criticized for saying during his show that NBC News and MSNBC never talked about the Obama administration’s controversial use of missile strikes from drone aircraft in the Middle East when an MSNBC reporter broke the news of a memo in which White House officials laid out legal justification for the program. In both cases, the outlet seemed so intent on reporting a story which aligned with their political viewpoints that they didn’t fairly present the situation to viewers. This creates serious accuracy problems for the outlets and trust issues for the audience, as I note in my book’s first chapter. What is your view of those American media outlets considered to be liberal (i.e., MSNBC, CNN, the New York Times, Mother Jones) in their coverage of sensitive topics such as racism, homosexuality and the Middle East conflict? How different do you find them from their conservative peers (i.e., Fox News, New York Post)? When it comes to racism, as I write in my book, Fox News and conservative outlets believe that America’s playing field is level enough that most claims of institutional racism are unfounded. So they are skeptical about such claims and reflect middle aged, middle class white male viewpoints on the issue; that’s why Fox News Channel stars such as Bill O’Reilly and Sean Hannity spend so much time complaining about unfair accusations of racism made against white people and accusing people of color of race-baiting for raising the issue. They are giving voice to the attitudes of their audience. MSNBC and Mother Jones are more dedicated to exposing the other side of that equation. So MSNBC covered the Trayvon Martin shooting more than any other cable news outlet and Mother Jones unearthed the video in which GOP candidate Mitt Romney complained about 47 percent of the country wanting handouts from the government. It’s tempting to say that conservative news outlets have been or willing to twist the truth to serve their motives, but MSNBC has also ben criticized for similar excesses — though they seem more willing to admit errors are made and correct them when discovered. Ultimately, as I describe in the book, each outlet develops their own methods for superserving their audience, requiring consumers to be more careful and wide-ranging in their habits. How has casting of blacks in primetime TV changed since Hurricane Katrina? What, in your opinion, does it take to have a more civil discourse on race relations in America? I don’t think the casting of black actors on TV shows has been affected by Hurricane Katrina much. Since New Orleans was flooded, there have been two high-profile, fictional TV shows dealing with the disaster. One, a cop drama for Fox Tv called K-ville, lasted less than a season. The other, a drama for HBO called Treme, has garnered critical acclaim, but isn’t widely watched and is expected to wrap up soon. I think we have to start a lot of small conversations about race in America – the same way we’re starting conversations about gun violence, poverty, gay rights and many other pressing social issues. We can’t just talk about race when there is a crisis – our biggest mistake in America, as I note in the book. That’s like only thinking about your car’s maintenance when the engine fails. Talking about race outside of a crisis allows us to approach the discussion with open minds, respectful attitudes and honesty – all important requirements in this discussion. I know it is a very broad question, but briefly, what is your take on the impact of internet and social media on race discourse in America? One thing the Internet does very well is allow people of like minds and attitudes to find each other, no matter how unique their perspective. So a lot of people who might not fit the definition of mainstream America have been able to find each other and build online communities where their perspectives are valued and spread. Online outlets also allow people to galvanize action quickly. As I note in the book, social media was an important force in spreading word about the effort to push Florida officials into prosecuting neighborhood watch volunteer George Zimmerman for the shooting death of unarmed black teen Trayvon Martin. Websites with petitions calling for action filled up with signatures, advocates traded messages on stories about the effort, and the social media buzz convinced more traditional media sources to get involved in coverage. While some people can languish in their own silos of information, surrounding themselves with websites and social media which echo their own opinions, I think many other people use social media to sample a wide range of ideas – even those which they may not agree with – in order to remain as informed as possible. As I note in the book, social media and online outlets have given the audience more power than ever to set the agenda for news outlets facing more competition than ever for audience and advertising revenue. So educating the audience to reject stereotypes and prejudice in media is about more than scrubbing those awful notions from public discourse. It’s about training the audience to save media from itself.